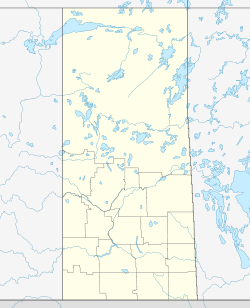 Whitewood is a town in the Canadian province of Saskatchewan. It is located approximately 175 kilometres (109 mi) east of Regina on the Trans-Canada Highway Sk Hwy 1. It is situated at the crossroads of two major highways systems – the Trans-Canada, which runs east and west, and Sk Hwy 9, which runs north and south from the US border to Hudson Bay, Saskatchewan. Located midway between Brandon, Manitoba and Regina, Whitewood was and continues to be an ideal place to stop and rest. It is administrative headquarters of the Chachacas and Ochapowace Cree First Nation band governments. Where Whitewood now stands was once grasslands, travelled only by nomadic First Nations people, white traders, trappers and buffalo hunters. Native plants and wildlife thrived in perfect balance. The people who followed the trails between the Valley of the Qu'Appelle and the Pipestone Creek left no more permanent marks on the landscape than the tracks of their Red River carts. With the settlement of the west and the coming of the Trans-Continental railway, Whitewood quickly grew into a thriving community. The CPR naming was derived from the White Poplar (Populus alba), a deciduous tree with white bark, which was plentiful in the area. By 1882, the town of Whitewood, Provisional District of Assiniboia, North-West Territories was a major stop on the Canadian Pacific Railway. The town grew steadily from that time and was incorporated as a town in 1892. An interesting note is that while the Town Seal has "Incorporated 1893" on it the actual incorporation took place on 30 December 1892. Burrows, Clayridge, Forest Farm, St. Luke, and St. Hubert Mission are small unincorporated areas near Whitewood. The Ochapowace (Ochapowage) Indian Reserve is nearby. Whitewood has a humid continental climate, with extreme seasonal temperatures. It has warm summers and cold winters, with the average daily temperatures ranging from −16.5 °C (2.3 °F) in January to 18.2 °C (64.8 °F) in July. Annually, temperatures exceed 30 °C (86 °F) on an average in late July Typically, summer lasts from late June until late August, and the humidity is seldom uncomfortably high. Winter lasts from November to March, and varies greatly in length and severity. Spring and autumn are both short and highly variable. On 5 July 1937 an extreme high of 41.1 °C (106.0 °F) was recorded, and on 12 January 1916, a record low of −45.6 °C (−50.1 °F). The 2011 Statistics Canada data estimates the town's population at 950 residents. Settlers from many lands came to the area and the multi-national character of the community is seen in the names of the residents to this day. The first Finnish settlement in the west, New Finland is located here, and Hungarians, Swedes, Germans, Poles, Russians, Czechs, English, Scottish and Irish, also made Whitewood their destination in the new world. To quote a prominent writer of that period, and resident of Whitewood John Hawkes, "Whitewood was in the eighties (1880s) the most cosmopolitan point in the west. It came to be a saying that one should know eleven languages to do business in Whitewood." Hawkes penned Saskatchewan and Its People in three volumes. One of the most unusual and glamorous settlements was that of the French Counts of St Hubert, Saskatchewan. Headed by the educated Dr Rudolph Meyer, this group of Belgian and French aristocrats aimed to build a life on the Canadian prairies in the style of the French nobility in Europe. Annually the Counts booked the Whitewood Commercial Hotel for the Frenchman's Ball. "Many pretty dresses of the style of the late eighties were in evidence, souvenirs perhaps of better days across the sea. The vivacious Frenchwomen of gentle birth and breeding in fashionable décolleté gowns and jeweled neck and arms lent an air of distinction in spite of the incongruity of the crude setting". Remains of this settlement still exist and many residents of the community are proud of their connection to the Most Romantic Settlement in the West. The town of Whitewood has a mayor as the highest ranking government official. The town also elects aldermen or councillors to form the municipal council. Currently the mayor is Doug Armstong, and is serving with councillors Gord McEwen, Todd Maki, Lee Aldous, Denise Istace, Tony Saltasuk and Brian Stevenson. The town administrator is Sharon Rodgers. Provincially, Whitewood is within the constituency of Moosomin served by their Member of legislative assembly, the honourable Don Toth. Federally, the Souris--Moose Mountain riding is represented by their Member of Parliament, Ed Komarnicki. As Whitewood has achieved town status, it has its own municipal government, however rural governments nearby are Willowdale No. 153 and Silverwood No. 123. Economically, Whitewood is situated in the Yorkton—Melville economic region. Whitewood along with Broadview, Grenfell, Wolseley are all part of the Mainline Regional Economic Development Authority. REDA's stimulate economic growth in the local area as they are familiar with the inherent needs of the community and stimulate business and government investment resulting in job creation, tourism and recreational facilities. Whitewood Airport (TC LID: CKY2), is located adjacent to Whitewood. Whitewood was established in the late 19th century on the Canadian Pacific Railway Trans-Continental railway. Currently, Whitewood is situated at the crossroads of two major highways systems – the Trans-Canada Highway Sk Hwy 1, which runs east and west, and Sk Hwy 9, which runs north and south from the US border to Hudson Bay, Saskatchewan. The Whitewood Herald is a weekly newspaper. Publishing since 1892, it is the oldest continuing weekly newspaper in Saskatchewan. John Hawkes was the editor of the Whitewood Herald from 1897 to 1900. The current owner and publisher of the Herald is Chris Ashfield, a fourth generation publisher. The Broadview Recreation Site is within 19 kilometres (12 mi) of Whitewood, and Spring Fountain Recreation Site is closer at 17 kilometres (11 mi). During Whitewood's centennial year of 1992, they collaborated on the history of the French Counts. The Merchant Bank Heritage Center soon followed which also celebrates the French Count history and displays the welcoming sign "The Most Romantic Settlement in the West." In the fall of 2002, economic development director Janet Blackstock along with Mayor Malcolm Green aimed to restore the homes built in the late 19th century by the French aristocrats and paint outside murals in Whitewood to re-vitalize the local history. One mural was painted in 2000 showing the town in 1890. The area of Whitewood claims that during the late 19th century, there were more aristocrats here than anywhere else in North America. ^ "2016 Community Profiles". Statistics Canada. Government of Canada. ^ National Archives, Archivia Net. "Post Offices and Postmasters". Retrieved 15 August 2014. ^ Government of Saskatchewan, MRD Home. "Municipal Directory System". Retrieved 15 August 2014. ^ a b "4705034 – Whitewood, geographical codes and localities, 2006". Standard Geographical Classification (SGC) 2006. Statistics Canada. 16 January 2007. Archived from the original on 6 July 2011. Retrieved 14 June 2009. ^ a b c d "Town of Whitewood – History of Whitewood". Archived from the original on 19 June 2009. Retrieved 14 June 2009. ^ a b c Fung, Kai-iu (1999). Barry, Bill; Wilson, Michael (eds.). Atlas of Saskatchewan Celebrating the Millennium (Millennium ed.). Saskatchewan: University of Saskatchewan. ISBN 0-88880-387-7. ^ Barry, Bill (2005). Geographic Names of Saskatchewan. Regina, SK: People Places Publishing Ltd. ISBN 1-897010-19-2. ^ "Canadian Climate Normals 1971–2000". Environment Canada. ^ a b "2006 Community Profiles". Statistics Canada. Government of Canada. 24 July 2008. Retrieved 28 September 2008. ^ "2001 Community Profiles". Statistics Canada. Government of Canada. 1 February 2007. Retrieved 28 September 2008. ^ Taché, J. de Labroquerie (print version); Adamson, Julia (online version) (17 October 2000) . "Census of Prairie Provinces Population and Agriculture Manitoba Saskatchewan Alberta". Ottawa: Printer to the King's Most Excellent Majesty: Table 3 Towns page 121 Alameda, Sk to Watson, Sk. ^ a b c d McLennan, David (2006). "Whitewood". Encyclopedia of Saskatchewan. Canadian Plains Research Center University of Regina. Retrieved 14 June 2009. ^ Hawkes, John (1924). "Saskatchewan and its People" (published online 15 June 2005). published online by Saskatchewan Gen Web. Julia Adamson. Retrieved 14 June 2009. ^ a b Sullivan, Kristian (6–11 January 2009). "The French Counts of St. Hubert: Local History as Social Commentary" (PDF). Paper presented at the Society for Historical Archaeology Annual Meeting Toronto Ontario. Paper. Department of Archaeology and Anthropology University of Saskatchewan. Archived from the original (PDF) on 2010-06-20. Retrieved 23 June 2009. ^ Grade 7 class at Henry Kelsey Public School (1975). E.T. Russell (ed.). What's in a Name?. Saskatoon: Western Producer Prairie Books. ISBN 0-919306-39-X. ^ "2011 Community Profiles". 2011 Canadian Census. Statistics Canada. July 5, 2013. Retrieved 2012-12-23. ^ Government of Saskatchewan, MRD Home. "Municipal Directory System". Archived from the original on 21 November 2008. Retrieved 8 May 2009. ^ Canadian Textiles Institute. (2005). "CTI Determine your provincial constituency". Archived from the original on 11 September 2007. Retrieved 8 May 2009. ^ Commissioner of Canada Elections, Chief Electoral Officer of Canada (2005). "Elections Canada On-line". Retrieved 8 May 2009. ^ "MacKinnon praises Mainline REDA for their successes". About Government/News Releases/February 1999/. Government of Saskatchewan. February 1999. Retrieved 15 June 2009. ^ "Prairie town looks to the past to save its future". CBC News. 5 October 2002. Retrieved 23 June 2009. ^ Adamson, J (5 November 2003). "Canadian maps 1924 Rand McNally Map". Rand McNally. Canadian Maps Online Digitization Project. Retrieved 10 February 2008. Wikimedia Commons has media related to Whitewood, Saskatchewan. This page was last edited on 21 April 2019, at 20:51 (UTC).